Penguin Basements | Creating the Perfect Basement Bedroom. 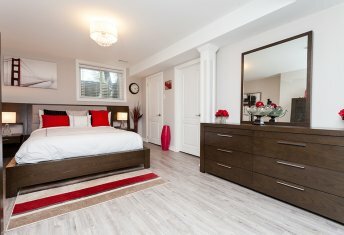 23 Apr Creating the Perfect Basement Bedroom. We first published this piece back in late 2016, but it still rings true today. One of the best ways to renovate your basement and create more useable space within your home is to create a basement bedroom which can be used as a guest room or even—where permitted and built our as a second suite—rented as a source of income. Of course, a basement bedroom could also be used as teen hideaway freeing up a room upstairs for more productive and shared use. In this article we will quickly cover a few useful things to consider when adding a basement bedroom to your home. A bedroom in any part of the house should feel comfortable and cozy, and a basement bedroom should feel no different. The most important thing is to ensure the space will be well insulated to avoid any potential mold and moisture problems in future. Moreover, the proper insulation will also reduce the noise level in the room. Deciding how you want a basement to look and too function as early as possible in the process helps properly establish timelines, material requirements and budgets. It also allows you to integrate details such as whether you industrial style loft bedroom will feature an open ductwork painted ceiling, or your French provincial retreat will feature smooth ceilings and complex trim. Our advice here is to make sure you have decided upon a style for your future bedroom before any work is begun. The nice thing about a basement bedroom is you can choose to follow decor set by the rest of the home to integrate the room with the rest of the house, or you can take advantage of its isolated nature to explore truly fresh ideas and themes. In a basement you are likely working with limited ceiling height and natural light. Therefore it is important to think about adding some light and space via smart decor choices. You can fool the mind into feeling any space is bigger and more inviting by using light paint colours, smaller and more ceiling light and mirrors that will help visually broaden any small space. Some other visual tricks you may opt for include vertical stripes or texture on wall coverings that visually hint to increased room height. As a bedroom is a place to sleep and feel safe and relaxed, you need to play on this feeling by using comforting colours and decorations. Most interior designers advise to use warm neutral tone for the whole room, with the addition of one accent wall still in warm but brighter hues in order to drive away any dreariness. The main idea here is to keep your colour palette simple and not overly complex and jarring. Our last piece of advice? Be creative, close your eyes and think about your personal vision for the room, only then will the result be perfect!